Smart rings are technologically advanced wearable electronic devices that are being used for information storage and sharing. The rings are used for receiving pictures, videos, calls, storing contact information, and any other digital information that can be transferred securely from smart phones. The report states that the global smart rings market was valued at US$1.67 mn in 2016 and is expected to reach US$11.44 mn by the end of 2025, as the market is slated to register a CAGR of 24.0% between 2017 and 2025. Internet of Things (IoT) and related services are an important driver for the development and diffusion of smart rings. Growth of cloud computing is also a significant indicator for the growth of smart rings. Cloud services allow more usage capacity on these small miniaturized devices with limited processing capabilities. Therefore, the data collected by the smart rings can be directly stored to personal data repository, thereby facilitating users to control their data management under high data privacy standards. Hence, IoT and cloud computing services are crucial for the smart rings to perform and broadening its scope and availability is expected to broaden the global smart rings market. The smart rings market is segmented on the basis of type of operating system into Android, IoS and Microsoft Windows. The android operating system segment is is anticipated to acquire the largest market share both in terms of revenue and volume. Analysts anticipate that this segment will account for a share of 57% in the global market by the end of 2025. The growing popularity of android smartphones, their convenience, and affordability is likely to be the key growth driver for this segment. On the other hand, the IoS operating system is likely to the fastest growing segment throughout the forecast period. Technologically, the global market is segmented into Bluetooth-enabled smart rings and NFC-enabled smart rings. Bluetooth enabled smart rings acquire the dominant market share since they can be easily integrated with smart phones. However, NFC enabled smart rings segment are expected to grow with the highest CAGR as these smart rings are capable of performing without batteries or electricity. On the basis of applications, the market has been further segmented into mobile/contactless payments, user authentication and access control, information sharing, monitoring healthcare system and others. The NFC-enabled smart rings are able to perform contactless payment functions while information sharing includes receiving call, text email and other notification alerts. Further, monitoring healthcare has been emerging as the most important application sector given its ability to track various fitness issues such as monitoring blood pressure levels, heart beat and pulse rate among others. The others application segment includes functions such as controlling audio and brightness of smart phones and taking pictures among others. Geographically, the global smart rings market is divided into Asia Pacific, North America Europe, the Middle East and Africa, and Latin America. Of these, Asia Pacific is presently holding the largest market share both in terms of value and volume and is expected to maintain its dominance over the forecast period. This region is anticipated to progress at a CAGR of 23.2% between 2017 and 2025. An exponential rise in the usage of consumer electronics such as wearable devices, tablets, and smart phones has propelled this regional market in the past few years. Furthermore, the efforts to digitize emerging economies is also expected to favor market growth in the near future. Some of the leading market players in the smart rings market are McLear Ltd., Log bar Inc., Moodmetric, Shanxi Jakcom Technology Co., Ltd., and Ringly Inc. among others. This report covers the analysis and forecast of the smart rings market on a global and regional level. The study provides historic data of 2016 along with forecast for the period between 2017 and 2025 based on volume (Thousand Units) and revenue (US$ Mn). Smart rings are electronic wearable devices worn on the finger. It works through movement of the fingers and gesture control. The smart rings are equipped with sensors and chips which enables it to perform various functions such as receiving call, message and email alerts, making contactless payments, measuring blood pressure levels, pulse rates and heart beats and it also provides biometric solutions by monitoring access controls among others. The study provides a decisive view of the smart rings market by segmenting it based on type of operating system, technology, applications and regional demand. The type of operating system, technology and applications segments have been analyzed based on current trends and future potential. The market has been estimated from 2017 to 2025 in terms of volume (Thousand Units) and revenue (US$ Mn). Regional segmentation includes the current and forecast demand for North America, Europe, Asia Pacific, Latin America, and the Middle East and Africa. These have been further sub-segmented into countries and regions with relevance to the market. The segmentation also includes demand for individual applications in all regions. The study covers the drivers and restraints governing the dynamics of the market along with their impact on demand during the forecast period. Additionally, the report includes potential opportunities in the smart rings market on the global and regional level. The study encompasses market attractiveness analysis, wherein applications have been benchmarked based on their market size, growth rate, and general attractiveness for future growth. The market has been forecast based on constant currency rates. Prices of smart rings vary in each region and are a result of the demand-supply scenario in the region. Hence, a similar volume-to revenue ratio does not follow for each individual region. Individual pricing of smart rings for each application has been taken into account while estimating and forecasting market revenue on a global basis. Regional average price has been considered while breaking down the market into segments in each region. The report provides the size of the smart rings market in2016 and the forecast for the next nine years up to 2025. The size of the global smart rings market is provided in terms of both volume and revenue. Market volume is defined in thousand units, while market revenue for regions is in US$ Mn. The market size and forecast for each product segment is provided in the context of global and regional markets. Numbers provided in this report are derived based on demand generated from different applications. Market estimates for this study have been based on volume, with revenue being derived through regional pricing trends. The price for commonly utilized grades of smart rings in each application has been considered, and customized product pricing has not been included. Demand for smart rings has been derived by analyzing the global and regional demand for smart rings in each application. The global smart rings market has been analyzed based on expected demand. Market data for each segment is based on volume and corresponding revenues. Prices considered for calculation of revenue are average regional prices obtained through primary quotes from numerous regional suppliers, distributors, and direct selling regional producers based on manufacturers’ feedback. Forecasts have been based on the expected demand from smart rings. We have used the top-down approach to estimate the global smart rings market, split into regions. The type of operating system, technology and applications split of the market has been derived using a top-down approach for each regional market separately, with the global type of operating systems, technology and applications segment split being an integration of regional estimates. Companies were considered for the market share analysis based on their product portfolio, revenue, and manufacturing capacity. In the absence of specific data related to the sales of smart rings of several privately held companies, calculated assumptions have been made in view of the company’s product portfolio and regional presence along with the demand for products in its portfolio. The report covers a detailed competitive outlook that includes market share and company profiles of key players operating in the global market. 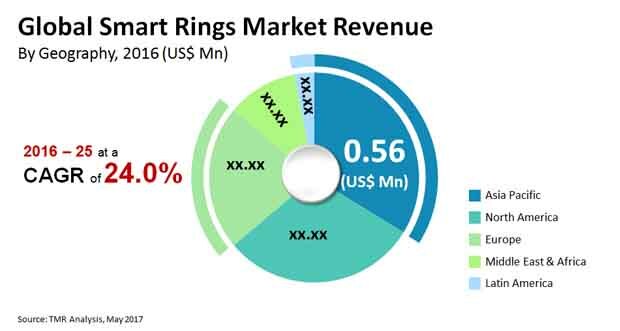 Some of the leading market players in the smart rings market are McLear Ltd. (U.K), Log bar Inc. (Japan), Moodmetric (Finland), Shanxi Jakcom Technology Co., Ltd. (China) and Ringly Inc. (U.S.) among others.